When mention to Nha Trang city, the diners who are looking for the special food will not forget talking about one special Vietnamese Street Food there. 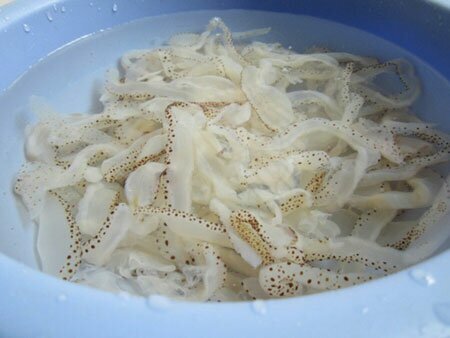 It is Jelly fish noodles (Bún sứa). Make sure you will not miss this dish when visit this city with your family and friends. >>> Other: travel to dalat guide with the best attractions, reviews, photos, map, weather, hotels and budget tips. 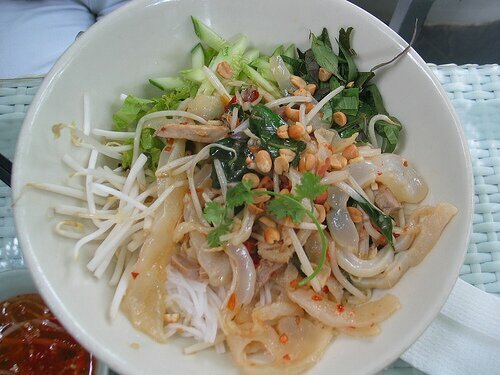 Even Jellyfish noodles is Vietnamese Street Food and is sold popularly on the street, it is hard to prepare and making. The broth of jellyfish noodles has a bold Middle of Vietnam’s culture. To make one broth bowl, the cookers will extract the water from the fish like tuna, pork and “Mắm ruốc”. The main ingredient of making this noodle is absolutely jellyfish. This jellyfish is totally different the jellyfish that make itching us. So you do not need to worry about it could negative affect you. To catch this jellyfish, the fishermen have to go a long distant to take it. They usually call them are “Foot jellyfish” to distinguish with others. After catching them, the fishermen will clean them; they will turn their color from white to nice purple blue. Then they use the acrid in the guava to clean them again. Similarity with other noodles, you have to add the clean and fresh vegetables when eating it. ThisVietnamese Street Food is more delicious, if you have salad, herbs. Moreover, one of special thing that you cannot forget is chilies. It is one main ingredient of Middles’ Vietnamese. They never ever take the chilies out of their meal in once time. The different of this noodle depends on the ingredients which follow the cookers. Some of restaurant on Phan Boi Chau Street provide one colorful jellyfish noodle which includes more crab, shrimp and pork. On the other hand, the restaurant at the corner between Bà Triệu Street and Yersin Street is quite simple. It only has tuna and jellyfish. To sum up, come to Nha Trang city and do not forget this style of Vietnamese Street Food, if not you will highly regret. Hope you have a happy trip with your beloved family and friends in my beautiful country.